Pretty Lady serves up classic diner fare, fist bumps, and homemade kimchi. Chris Duffey At Pretty Lady, owner Sung Son dispenses fist bumps as well as omelets. Hours: Mon.-Sat. 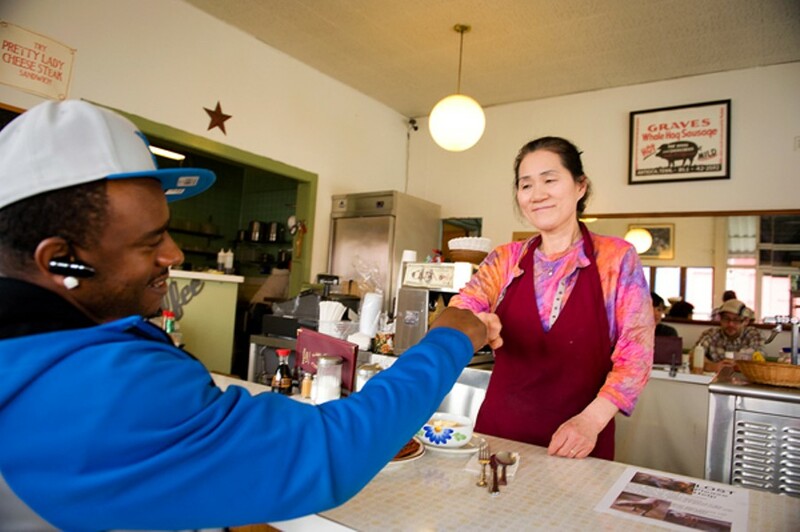 7 a.m.-2 p.m.
At the West Oakland diner known as Pretty Lady, every customer receives a fist bump from Sung Son, the Korean woman who runs the place. It's an endearing quirk at a restaurant full of endearing quirks. English might not be Son's native language, but any regular customer will attest that she is fluent in grooving to oldies and in making guests feel welcome. You seat yourself at the horseshoe-shaped counter and, after the bumping of fists, you can ask Son or her husband (who helps out on busy days) for a complimentary plate of kimchi. Pretty Lady, it should be noted, is not a Korean restaurant. According to Son, the greasy spoon has existed at its Peralta Street location under the same name since the Fifties. She and her husband took over eight years ago, and they kept the focus of the menu more or less the same: omelets, pancakes, burgers, and other American breakfast-and-lunch standards. But, though it isn't listed on the menu, Son has always served kimchi — an excellent homemade version that's more pungent than it is spicy — because, well, she's Korean, and because she thought the customers might like it. And although Son is fond of pointing out how she's been putting kimchi in burritos for longer than the oldest Los Angeles-based Korean taco truck, Pretty Lady doesn't really do Asian fusion — it isn't one of those places where some young hotshot chef is putting out sous-vide pork belly. At Pretty Lady, seven dollars will buy a simple, filling meal, and the diverse crowd is solidly working class — a mix of truckers and construction workers, artists who have studios nearby, and neighborhood folks. There's not much "fusion," but teriyaki rice bowls seem comfortable sharing menu space with cheesesteaks and Denver omelets. And if you would like some kimchi mixed into your breakfast, Korean-taco-truck style, Son is happy to oblige. I'd heard, for instance, that you can request kimchi in your breakfast burrito — surely an awesome thing. But when Son brought my burrito, she said, regretfully, that she'd forgotten to add the kimchi. (She ended up giving me an extra-generous portion on the side.) I have to say, though, the breakfast burrito was more or less perfect as it was, all of the contrasting textures mushed together into one gloriously savory and cohesive whole: scrambled eggs, bacon shards, melted cheese, and — the clincher — crispy breakfast potatoes. Would the addition of sautéed kimchi have taken it to an even higher level of awesomeness? I'll leave that for you, dear reader, to find out. Pretty Lady also offers a standard array of three-egg omelets, which might not be airy enough (or made with posh enough stuff) to qualify as masterpieces of the genre, but they're hearty and workmanlike specimens. Together with a side of toast and crispy country-style hash browns, it's the kind of breakfast that will keep you going until dinnertime. On the sweet side of the menu, I wasn't won over by the huge, somewhat leaden banana pancakes. The generous French toast plate, which comes with eggs and a choice of meat, is a better choice — a simple, home-style version of the breakfast staple, very eggy and soft, and dusted with cinnamon sugar. If Mom or Dad made French toast for you when you were a kid, there's a decent chance it bore some resemblance to Son's. One of the restaurant's signature lunch items is the cheesesteak, which, while not strictly traditional, was a close-enough approximation to satisfy this transplanted East Coaster's cravings: plenty of thinly-sliced beef, Cheese Whiz (no frou-frou substitutions here), and sautéed onions, all heaped onto a soft, mottled Dutch Crunch roll. Or, if you're in more of an Asian-craving frame of mind, a rice plate featuring pork marinated in spicy-sweet Korean gochujang made for another filling, inexpensive lunch, though the pork wasn't as tender as I would have liked. Feeling only halfway Asian? It's not uncommon for customers to order their rice plates with French fries on the side; the health-conscious can stick to soup or salad. We asked Son to throw a couple of fried eggs on top, and you won't regret doing the same. Later, I learned of another off-menu special: bibimbap — a cobbled-together version of the classic Korean rice bowl, more or less traditional, but served on a plate rather than in the customary sizzling stone vessel. Certainly there's lots of better Korean food to be had in Oakland, and there are a few other places where you can get a proper greasy-spoon-style breakfast. But to be able to enjoy both cuisines side by side, seated at what is perhaps the most pleasant old-fashioned diner counter in town — and with such charming service? Pretty Lady is a rare gem indeed. By the end of my first meal, I dispensed with knife and fork altogether, and ate the rest of my cheesy sausage omelet with chopsticks, snagging a piece of kimchi to go with every bite. The combination — a sort of practical, improvised Asian fusion rather than some cheffy conceit — felt as natural as Thanksgiving turkey with a side of Chinese sticky rice, or a burrito stuffed with Tater Tots. What child of immigrants doesn't have cherished food memories such as these? To me, quite simply, it felt like home.